Disease relapse characterised by an increase in sFLCs, with or without an associated increase in intact immunoglobulins, has been shown by a number of studies to be associated with worse patient outcomes. For a MM patient with a monoclonal intact immunoglobulin at diagnosis, “light chain escape” or “FLC escape” is the term used to describe disease relapse with just monoclonal FLC production. This is examined in more detail in Section 18.2.1 but here, the prognostic implications of FLC escape are considered. A study of 104 patients who relapsed after bortezomib-based salvage therapy  found that 15 (14%) relapsed with an altered disease phenotype, of whom 9 (9%) had plasmacytoma/plasma cell leukaemia and 6 (6%) showed FLC escape. 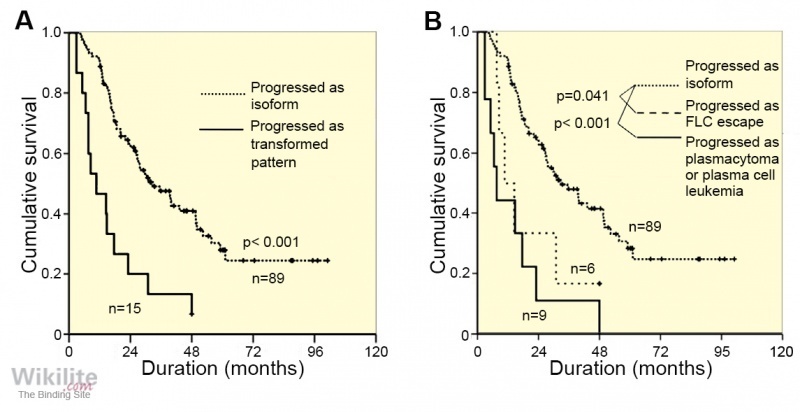 The transformed group had significantly worse median overall survival (10.7 vs. 32.7 months; p<0.001) (Figure 20.6). A separate investigation of relapse in 232 patients  reported changes of immunoglobulin production in 39 (17%) patients, of whom 15 (6%) had FLC escape and 7 (3%) had monoclonal immunoglobulin escape. Both of these groups had similarly short survival after the change in production (approximately 3 months). Brioli and colleagues  have published the largest analysis of clonal change at relapse to date, and reported that 10.4% (54/520) IIMM patients relapsed with FLC escape, 35.2% (183/520) relapsed with rising intact immunoglobulin plus FLC, while 49.6% (258/520) relapsed with significant rises in their intact immunoglobulin alone. 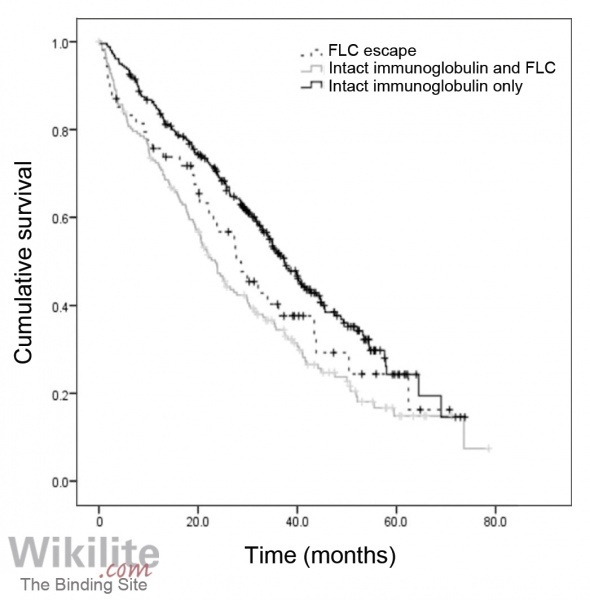 Interestingly, they found that patients who relapsed with FLC alone or FLC plus immunoglobulin had similarly reduced survival after relapse compared to those without rising FLC (p=0.002; Figure 20.7). Tacchetti et al. reported FLC escape in a similar proportion of patients (10%). The authors also confirmed the prognostic significance of disease relapse characterised by an increase in sFLCs, with or without an associated increase in serum monoclonal protein. Increasing sFLCs predicted an imminent risk of progression with end organ damage in 70% of cases, and on multivariate analysis, an involved/uninvolved sFLC ratio ≥120 at relapse was an independent variable that predicted a shorter time to second progression (HR: 7.26). The authors conclude that these findings confirm the value of monitoring patients with sFLC measurements after treatment with novel agent-based therapies. Disease relapse associated with significant increases in sFLCs can sometimes occur without signs and symptoms of end-organ damage. This is termed ‘biochemical relapse’ and was defined in IMWG consensus panel recommendations published by Rajkumar et al. . For example, the definition of biochemical relapse by sFLC analysis requires an increase in iFLC by ≥200 mg/L (plus an abnormal sFLC ratio) in 2 consecutive measurements separated by ≤2 months. IMWG guidelines recommend that patients experiencing biological relapse alone do not necessarily need to be treated immediately . However, data from Katodritou et al. show that many clinicians prefer to start treatment at biochemical relapse. When they compared the outcomes of 207 MM patients who started therapy with lenalidomide/dexamethasone at either biochemical (n=140) or clinical relapse (n=67), they found that median PFS was significantly longer in patients treated at biochemical relapse than at clinical relapse (24 vs. 13.2 months, p=0.006). This difference remained significant after adjustment for other prognostic factors. Therefore, earlier therapeutic intervention before the development of symptomatic disease may lead to a more favourable outcome.